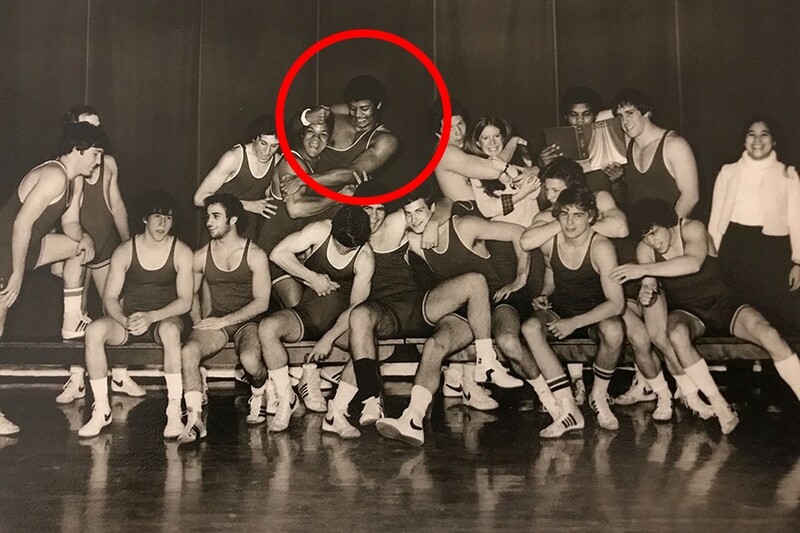 Tony Cimmarrusti, teammate: Back then he was Neil Tyson. Paul Widerman, teammate: My first impressions were, This dude is definitely different than the rest of the guys on the team! Neil had a very artistic and open-hearted aura. Sort of like an artistic scientist. Carol Marquez, team manager: He was a tall, lean guy who wasn’t big and bulky. Therefore, he didn’t fit my physical impression of a wrestler. He looked more like a basketball player. James A. Phills, teammate: He had a bit of an Afro and a mustache. And so he looked more like a big tough guy than Stephen Hawking. I remember looking at him and thinking, He’s gonna be pretty tough. But really, he’s this gentle, cerebral, graceful guy. Cimmarrusti: I didn’t know what an astrophysicist was, so “rocket scientist” was what we used to refer to him as. I used to call it astrology and asked him to read my fortune. He didn’t think that was funny. Widerman: I remember him having no patience at all for astrology. Phills: He was a very good wrestler for the Ivy League. Our schedule was the physical equivalent of being dumbed-down: The NCAA Championships weren’t even on our schedule because nobody had qualified for many years. Harvard itself was conflicted about its athletic success outside of the Ivy League. They worried that if we won, they would be compromising academic standards for athletics. But nothing could’ve been further from the truth for most of the guys on the team. Widerman: We had a blind wrestler and a deaf wrestler. But that’s wrestling. You figure out how to deal with who you are, and how to make it work. In fact, most of the guys on the team were liberal-arts guys who were more into reading. Marquez: Wrestlers as a group generally tend to be a quirky bunch of athletes. They’re very in their own heads and very cerebral already, even the ones who aren’t at Harvard. Then you go to Harvard, and they’re off-the-charts quirky head cases. When they weren’t actually wrestling, everything but wrestling was being discussed. We used to get teased by other teams because our guys would be reading or studying on the bench. David Baer, teammate: John Irving used to come in and practice with us. Widerman: Neil and I both had a passion for the sport and its technique. We both liked that it was very technically oriented — the better your technique was, the better you’d do. It’s not about force. You don’t knock somebody out; it’s all about technique and strategy and knowing your own body. Phills: Neil also danced, which is probably why he was a graceful wrestler. The way he moved and fought seemed to be informed by the kind of elegant equations that described the physics of the universe. Cimmarrusti: He was pretty good. If he’d applied himself, he could’ve been great, but Neil was one of those guys who was committed to academia even as an undergrad. While a lot of guys go to school to wrestle, he went to school to go to school. He wrestled as a form of exercise and enjoyment. But it wasn’t a major part of his life. He didn’t see that as representing who he was as a person or a man. He had a sense of calling. Widerman: Neil had sneaky, tricky, good technique. I think he was undefeated at the Bronx High School of Science. Had he snuck into a place like Nebraska or Oklahoma, where he would’ve gotten beat up for two years (which is a good thing), he might’ve become a great college wrestler. But that wasn’t gonna happen at Harvard. There wasn’t the structure in place to bring you along. Phills: His weight class was 190, which means he was one of two guys on the team who was closest to my weight class. I was a heavyweight. And one of the problems I had as a heavyweight was that there was no one else who was big enough for me to work out with. I’d been a pretty serious wrestler before college, so Neil was often tasked with being my sparring partner. But frankly, I probably had at least 20 pounds on him. I also had a different, more European technique, so nobody wanted to work out with the big fat heavyweight. Neil, though, was a great sport. There are times he’d probably have preferred to work with somebody closer to his size, but he was a great teammate in that way. Widerman: A lot of wrestlers at his weight class are about 5-foot-8, so at 6-foot-2, Neil was very tall for wrestling at his weight. He had to develop techniques that would work given his length. That’s why his headlock was pretty good! Phills: He did have a good headlock. Because he’s so long, he also had a very good cradle, where you kind of encircle somebody’s leg and their neck. If Neil got his arms locked around you in a cradle, you were toast. The handful of times he pinned me in practice, he did so with a cradle. Rick Sullivan, teammate: I was in my mid-30s and getting my Ph.D. when I wrestled him. He was a tough guy. Strong and athletic. By that time in my career I was devoting a lot of attention to not getting hurt, and I was well aware that he was fully capable of doing so at almost anytime. Phills: When I came to Harvard, I’d been a five-time junior champion. So I’d typically get the better of Neil. But he wouldn’t quit! I’d say, “Hey Neil, wanna take a break?” Because he was tired. He’d been trying to lift me in the air for a minute, and I’m putting all my weight on him. But he’d keep going. Widerman: As we became friends, I remember coaching Neil some, because I was a two-time state champion in high school. As such, I had incredible basics that I’d drilled a million times. So I started to coach Neil a little bit on these basics. At one point, we made a deal where I coached him in wrestling and he tutored me in physics. Phills: During Neil’s time, there were at least four strong freshmen who joined the team. The year that Neil was captain, he was instrumental in driving the shift from complacent mediocrity to a much more serious, competitive team that was expected to win. He would push for practices to go longer. I wish I could remember the content of his locker room speeches. It was also clear that he was trying to substantiate higher expectations by how he trained — he modeled the kind of perseverance and tenacity you want a captain to have. Widerman: When he’d teach me physics, I’d think, Why didn’t I get that? Because it seemed pretty easy the way he showed it to me. He could use the numbers in a way that reflected what was really happening and said I should accept certain elements of the math and keep moving forward. When I studied with him, I was like, God, I can’t believe it’s this easy. Phills: There were maybe three other African-American guys on the team, and I was like, “Where do you go to get your hair cut in a place like Cambridge?” I’d have to trudge down to Dorchester or some part of Boston to find a barber. Neil said, “I’ll cut your hair for you!” So when I needed a haircut, I’d go over to his dorm room, and he’d grab his clippers. Cimmarrusti: Argumentative? Yes. Outgoing? Yes. Talkative? Yes. He had the twinkle in his eye from a young age; he always had some kind of smile on his face. But there also was a smirk in there as well, and he was a prankster. I can’t remember any now, but he was right in the middle whenever they were going on. Widerman: I remember going back to his room, and he had a picture of a lightning bolt that he’d taken on the roof of a building in New York City. That was so far ahead of its time. Nobody I knew had ever found a way to photograph a lightning bolt. He also told me about how he made money walking dogs in order to buy his first telescope. Not to mention that he had a way of using sound activation to dim the lights and make a tray move in his dorm room. He was able to make a bottle of wine and two glasses come out. That’s when I realized he was very good at entertaining women! Phills: He was quite the ladies’ man. I’m sure the wine glasses and that contraption were designed to impress the many coeds he enticed into his room with stargazing and such. At least I don’t think he ever opened a bottle of wine and offered me a glass. Widerman: He had a card that said “Neil Tyson, Astrophysicist.” I think he might’ve had that tie with the planets on it in college, too. Phills: His mustache was always impeccably shaved and groomed. I’m pretty sure there was like a velour/velvet blazer or smoking jacket as well, which probably came out when the wine glasses popped out. Widerman: I remember him being stylish. It was his own style — fun-colored clothes, maybe cowboy boots and cowboy hats — but still stylish. Cimmarrusti: He dressed well. He carried himself well. He was either going to do something really great or really scandalous. It turned out, of course, that he did something really great. Phills: There are a lot of stereotypes about Harvard. But you’re a black astrophysicist wrestler who dances? It violates the simplistic conceptions of identity that people have. Someone like him is so intriguing and confounding to people who have simplistic conceptions of what an astrophysicist or celebrity is. That’s been one of the wonderful things about seeing his ascent and celebrity grow over the last 25 years.